It was the start of my Beauty Cleanse Juice Detox challenge where I tried to stick the suggested daily routine as proposed by the team of experts at Beauty Cleanse. By the time, I finished my fourth bottle of juice for the day, I was feeling so full and had no appetite for the fifth bottle of juice so I kept it in my fridge, just in case if I might need another bottle of juice to keep my hunger pangs away. I also found myself drinking lesser glasses of water than usual because the juices themselves helps to hydrates the body. But I would remind myself to take sips of warm water in between to also promote the detoxification process in the body. The colosan powder took about 6 hours before it starts to take effect on my body. The oxygen generated in my body made me feel rather bloated but the bloating ease a little by late evening just before turning into bed. If I am not wrong, I visited the toilet about 5 times during the first day! Due to the laxative effect of this supplement, what comes out from the guts is more of a watery fluid form than solid ( if you know what I mean!). Not trying to gross you out there ! But it would be good to be informed of this so that you could try yourself to locate and station yourself somewhere where there’s a clean toilet with sufficient toilet paper for you to use. Be prepared to make frequent visits to the toilet clear your guts! I felt great that evening and feeling proud of myself for having to go through DAY 1 really smoothly as I thought I was probably not going to make it through the first day! I also must say that those daily motivational emails from Beauty Cleanse had also played a party in motivating me to stay on track. I felt like hitting the gym for some yoga sessions or body combat classes but I was feeling quite lethargic which is probably due to my run of events last evening. So I skipped the idea of exercising but instead, went out to run some errands and try to sneak in some form of walking exercise to get the blood circulation and heart pumping going. But I had a good sufficient rest in bed last night as I woke up feeling refreshed but also hungry at the same time. By Day 2, I felt that my stomach capacity has shrunk by a fraction after spending one day without food. Thank goodness the morning breakfast juice with the supplements had somehow made me less hungry after gulping everything up. By late afternoon, the temptations and cravings started to kick in but thankfully, I carried a bottle of Beauty Cleanse juice and a bottle of alkaline water to whenever I go. So whenever the hunger pangs set in, I quickly take quick sip of juice or water and it really helps to fill the stomach. Especially the sweeter juices like the Purple-coloured juice ( beetroot-based) and orange-coloured juice (carrots-based) helps to bring up the blood sugar level and keeps you feeling satisfied. These two sweet juices happens to taste really delicious too and these ‘SOS’ juices are probably what you need when food temptations arises. On Day 2, I also increased my colosan powder intake to about 2 tablespoons and I kind of regretted consuming that amount because I had to make subsequent visits to the toilet almost every hour. That day, I must have visited the loo like 12 times. But on the contrary, I felt ‘cleaner’ as my guts are being ‘swiped’ clean with oxygen. But thank goodness, I was resting at home that day, which made it easier for me to empty my guts out. By evening, I find it easier to enter into a good deep slumber. Ahhh, the juices are finally working! When life hands you lemons, I grit my teeth and pop them into my mouth. Day 3 was the toughest. Like any juice fast regulars, they would say that you could start feeling the ‘hangover’ and the perpetual tiredness setting in as the body is trying its best to adapt to the new diet of drinking just juice. It always takes a few days for the body to recognise that there’s a change going on before it adapts to the change. 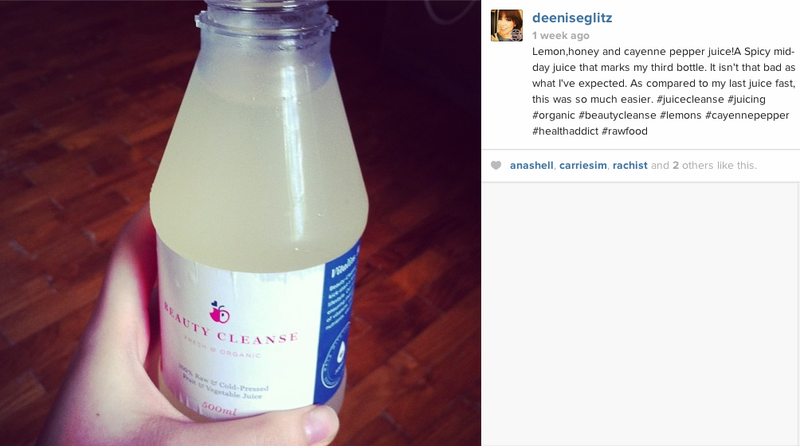 At some point, I felt like cheating like grabbing a banana which my parents had just bought from the supermarket or sampling a piece of chocolate which my friend offered me but I learn how to resist by telling myself that I would not witness and experience the full positive effects of juice cleanse if I had cheated. Besides, it’s a challenge and I tripped and fall this time, I probably wouldn’t know how to face you readers. Bare the sourness for it will do your body good. As I was out running for events that whole day, I decided not to consume colosan powder that morning in fear of having to run and search for toilets in midst of a busy day at work. Though there’s quite a bit of inconvenience to this but I deem it as necessary. Afterall, this is all part of the detox programme. But if I am embarking on a juice fast again, I would have done it during my holidays where I could also take the time to heal my body and do some meditations or light yoga. I can’t believe I’m still alive ! It’s been three days since I last ate solid food. It’s quite hard to believe that I haven’t been eating proper food for the past three days. I was further reminded of how insane this was after a few of my friends started commenting on my instagram that they would have never survive if they had gone on a juice fast. One of them mentioned that she was afraid that she would faint if she ever goes on a juice fast. And if I didn’t faint and fall flat to the ground by Day 4, I think I might have been born to be an immortal in disguise. Was I an angel in my past life? However, I did felt like I was floating, just like how Casper the friendly ghost would float aimlessly about. I had no idea whether it was a sign that I was going to faint or whether it’s the fact that I’ve lost weight. It turns out that it was the latter as I weighed 3 kg lighter than before. But somehow, I gained back the 1 kg after drinking 3 bottles of juices that day and from then on, I never really dared to step on the scale. No more delusions of me of be losing weight. Maybe the tightness in my jeans would be a better indicator of how much weight I lost. By right, there should be some improvement to my skin’s suppleness and radiance but I couldn’t really tell as I had a facial treatment yesterday. However, I do notice that my eyes were brighter which made me look more radiant. FINALLY! It was a mixed feeling for me on Day 5 as I half wanted to continue with the juice fast to see how my body would even transformed to but I also half wanted to savour the freshness and goodness of solid food again. I was feeling great in the morning when I woke up but my mood suddenly plunge down when I suddenly realized that there was a missing juice bottle in my fridge! It turned out that my mum actually drank of the juices despite telling her that I am only surviving on these 6 bottles of juice per day. You could have imagine how mad I was that day! Blame it on the juice bottles which looked so attractive and enticing that my mum had actually ‘stolen’ a bottle! I forget to ask her if the juices tasted delicious or not but I guess I probably wouldn’t need to as she almost finished every bit of lemon juice with cayenne pepper and honey. After the stormy morning, I went to the gym for my usual exercise routine. On most days, I would have the energy to do four hours of class with 2 hours of cardio but that day, my energy levels weren’t that high. Even after my spinning class, I was feeling a little faintish so I didn’t dare to push myself to max out my bike resistance load. So, if you’re on a juice fast, stay light with cardio exercise. 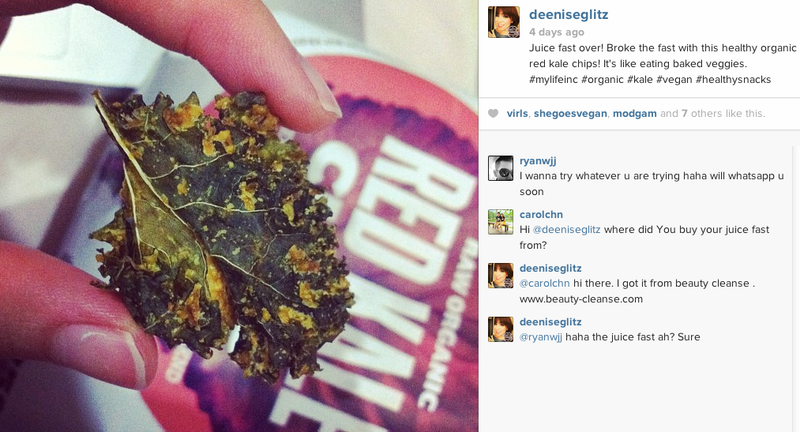 It must be coincidental that I was send a packet worth of delicious raw organic goodies right after the juice fast. 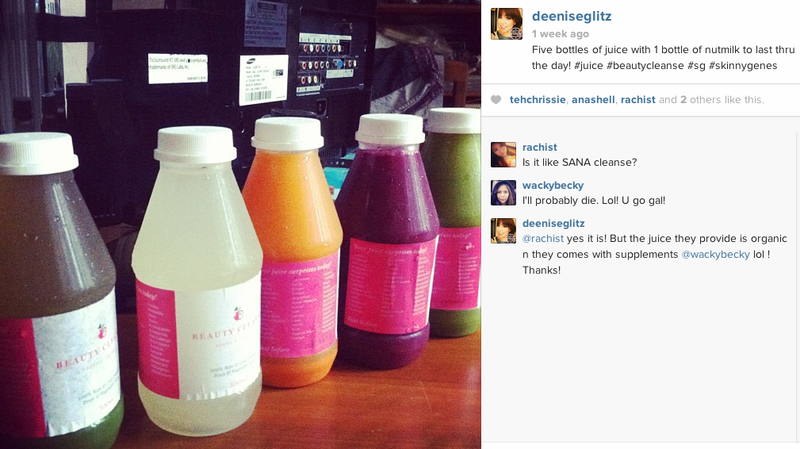 Ahhh.. somehow I am missing my juice fast days. How I wish it was longer … like 14 days? I am already planning for my next juice cleanse fast. What about a 30-Day juice fast challenge?